The Sambuddhaloka Buddhist Vihara in Moreno Valley is dedicated to meeting the spiritual needs of the communities in Southern California based on the teachings of the Gautama Buddha. In line with the Theravada tradition of Buddhism, we aim to provide guidance for individuals to develop their mind in the pursuit of “Nibbana” (eternal peace) and to be better human beings in their daily lives. While addressing the religious and cultural needs of the Buddhist community, Sambuddhaloka Vihara does not discriminate anyone because of their race, color, national origin, gender, age, or religion, thereby bringing the teachings of Buddhism to a wider audience. 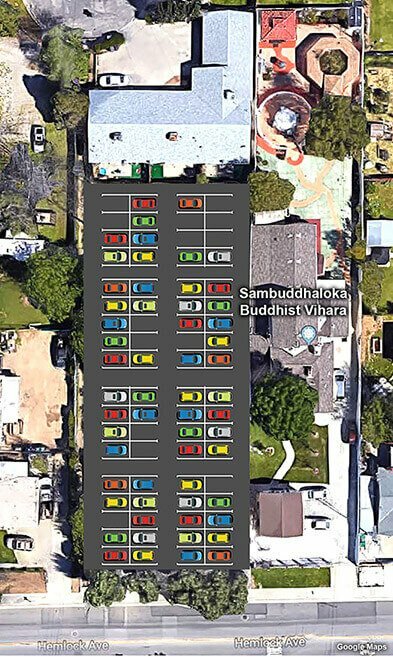 Sambuddhaloka Buddhist Vihara, a Buddhist Temple in Moreno Valley, Riverside, is planning to purchase an adjacent property and expand its premises. The intent of this expansion is to utilize the additional space for meditation and mindfulness programs, to hold cultural events, support Dhamma school activities and to provide safe parking for all participants. Write a check payable to "Sambuddhaloka Buddhist Vihara"
The Sambuddhaloka Buddhist Vihara Inc. is a registered non-profit charitable organization. All contributions are tax deductible. Copyright ©2018 Sambuddhaloka Buddhist Vihara | All rights reserved.